New pattern alert!!! The pattern for the Queen of the Castle House is now available on the shop!!! She's the Queen of the house! She's the Queen of our hearts! So I guess it's only fitting that her home should be a castle! Because I want my Queen to be safe, in the moat lives a sea monster that captures all that adventure there uninvited! Also, the house has three windows so that she can spy on us from every side! Make sure to announce your visit or you'll end up like this unfortunate fellow! This cute little fella is Her Majesty's personal guard! A little throwback to when Mini Me went to visit the Queen! The PDF crochet pattern for the Queen of the Castle House has 127 pages with detailed step by step instructions with pictures in order to demonstrate assembly, any special techniques or other more complex parts. It includes instructions on how to make the house sturdy so it can hold its shape. Accompany me while I finish the Queen of the Castle House! Magical, whimsical and with a super cute neighbor! It has a window on the side so kitty can observe the outside without being spotted. The Into the Woodland House is made mainly with t-shirt yarn! It's very comfy, with a cushion inside where kitty can curl up and dream! The house is 37cm (14.57 inches) tall, 31cm (12.20 inches) wide and the lawn has a diameter of 66cm (26 inches). A fun texture on the underside of the mushroom cap makes this fun house even more like a mushroom. The PDF crochet pattern for the Into the Woodland House has 46 pages with detailed step by step instructions with pictures to demonstrate assembly or any special techniques. It includes instructions on how to make the house sturdy so it can hold its shape. This time around I made the birds in pink and purple as asked by Hilary! I also made the house a bit taller and added a zipper to the cover of the cushion, making it easier to clean or wash. The Into the Woodland House is almost ready! The On the Road House is very spacious! 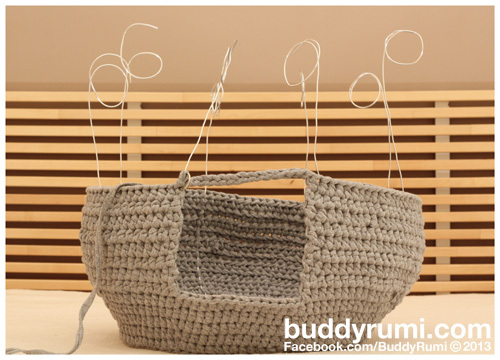 (Height: 44cm / 17 inches; Width: 76cm / 30 inches; Depth: 38cm /15 inches) It fits 2 to 3 cats or small dogs. Perfect for those furry friends that like to huddle up together to sleep. It has a pillow inside so that your pets can sleep comfy and warm. This crochet home has windows on all its sides. You can't escape their eyes! The PDF pattern for the On the Road House has 50 pages with detailed step by step instructions with pictures to demonstrate assembly or any special techniques. Check out the video to know all the details! 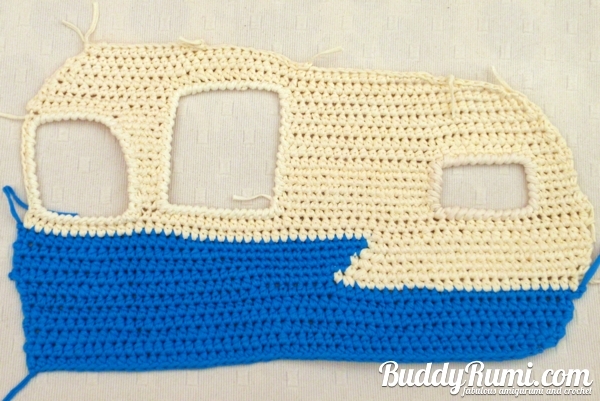 The On the Road House is made with off white and blue t-shirt yarn, and bulky yarn in blue for the cushion! I hope you are as excited as I am to see this project complete! I'm already in the final stages of the On the Road cat bed.The structure and cushion are finished, I just need to add some cute details and it's done! The front has a big door, and windows that your furry buddy can use to see what's going on outside! 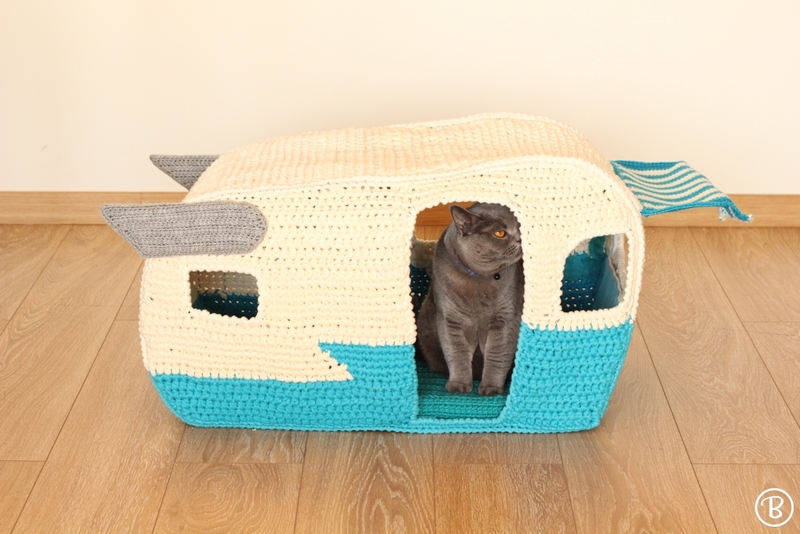 The On the Road pet house is spacious enough for two kitties or two small dogs. The back has three windows. There are windows on the sides as well just like the real vintage caravans! This doggie is a custom request! The model is a cute Jack Russel Terrier mix named Penny! I really want to capture the shape of her cheeks and nose, I'm trying out different techniques to see which I one like. 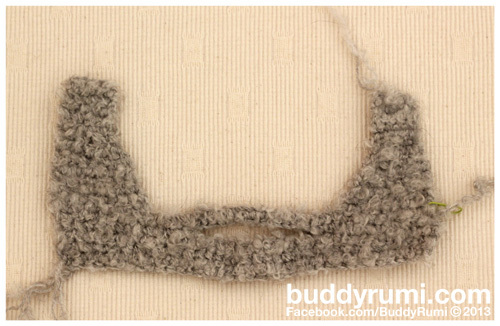 BuddyRumi on the Let's Knit Magazine! The House in the Forest was featured in an article about knitting and crocheting for our pets! The Kitty Kat House was featured on Apartment Therapy, a site dedicated to inspire people in making their home beautiful, organized and healthy! It's a beautiful site full of beautiful images, ideas and resources! The Kitty Kat House (second on the list) is featured in the article 7 Cute Cats Enjoying DIY Projects Their Humans Made For Them alongside other six cute creations by other artists. Hello everyone! It's time again to show you what I've been working on! The front is already completed and waiting to be assembled. The back is almost ready, I just need to make the boarder and finish the support. The rest of the house is composed of a really long piece of t-shirt yarn (the longest I made so far!) that makes up the floor, ceiling and sides of the house. 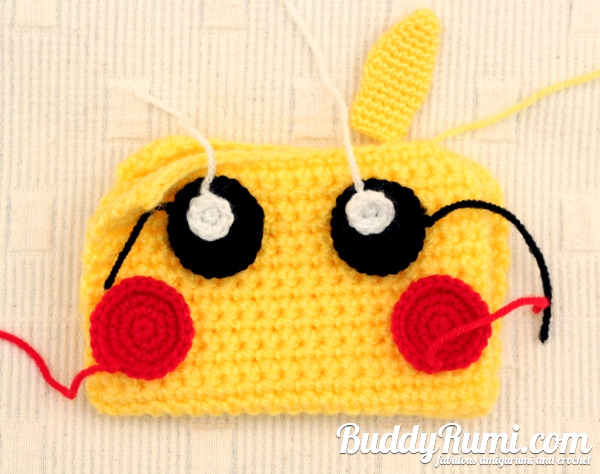 I'm working on a Pikachu wallet, which is almost completed. I'm not completely happy with his ears, I'll will have to test several models and choose the one I think is the best. I began to work on this new design in April but I had to pause it because some requests for other projects came through and I had to work on them. I'm not entirely sure, now, how the idea for this design came to me but I remember this image of a cute vintage trailer with a kitty peaking through the window appearing in my mind, right then I knew I had to make it! The basic shape of the front of the trailer is done. Just before I had to pause it, I was working on how to reinforce it so that the house can stand. I still need to figure out some details, I want the house to have wheels like a real trailer but that means that the bottom would be off of the ground so I have to figure out a way to make the bottom strong enough to hold the weight of the cats, and a way for the cat to go inside the house without having to jump. Can't wait to get back to it!!! Share pictures of your kitties enjoying the House in the Forest on our Facebook page! 2013 was a great year, BuddyRumi grew and took on new challenges. For the first time I started to make finished buddies and not only patterns (that really made a diference this December)! For now the finished buddies are only available through local stores but I'm thinking of making some available through Etsy too. With all these new challenges some of the pattern releases have been delayed but have not been forgotten. I hope you'll be patient with me and wait a little while longer as I finish the patterns for the Tree Trunk Shaped Cat House and the Periodic Table Blanket. In 2013 I made some of my favorite buddies so far! The house has a comfy cushion inside! I'm happy to say that this past week I manage to make progress on several projects! I had to unravel the Totoro shaped cat house, it was getting too wide and I didn't like it. I'm much happier with its shape now!